In the chemistry laboratory, we can use our understanding of kinetics to both measure and manipulate the timeline of death. Specifically measuring the time of death and preserving evidence after death. The Rate Method � in this method the time of death is estimated by evaluating the presence/absence of an indicator in a deceased in conjunction with the known behavior of such indicators. The Concurrence Method: � in this method the time of death is estimated by evaluating events which happen at or near the time of death, or offer information suggesting a time period for the death event. You will note that in each type of determination the word "estimated" is used to describe the method. This is because despite all of the advancements made in science, time of death is still one of the least reliable methodologies we have. There are just too many variables that can skew results for it to be an exact science. The first steps in determining time of death are 1) collection of the body, 2) collection of any evidence around the body and 3) collection of information about the deceased. Let's go through each of the methods shown in the table above and discuss how they are used to determine time of death and then in the last section we will discuss in more detail the chemistry involved so you can impress your friends with your knowledge the next time you watch CSI or Bones. Blood is a complex mixture of many types of cells, nutrients and cellular waste but predominantly it is water. As an aqueous fluid, blood will dry at a predictable rate if we know the environmental parameters: temperature, humidity, airflow, surface area etc. If the body feels warm and no rigor is present, death occurred under 3 hours before. If the body feels warm and stiff, death occurred 3-8 hours earlier. If the body feels cold and stiff, death occurred 8-36 hours earlier. If the body is cold and not stiff, death occurred more than 36 hours earlier. Because the reason for Rigor Mortis is a chemical reaction, the kinetics of the reaction can be affected by the same factors as any other chemical reaction. The temperature around the body will either increase the rate of rigor (hot) or slow it down (cold). Illnesses that already cause the body to have increased amounts of acid in the muscle tissue (higher concentration) will increase the rate of rigor. Strenuous activity right before death will also increase the rate of rigor since activity also increases the amount (concentration) of acid in the muscles. Other environmental aspects can cause a change in the rigor timeline, most specifically movement of the body once rigor has set in. If the body is manipulated during the process of rigor, forced to move or bend despite being stiff, the rigor is broken and will not reform back to normal standards. This makes setting time of death for bodies that have been manipulated or dumped using the Rigor Mortis timelines harder or impossible. 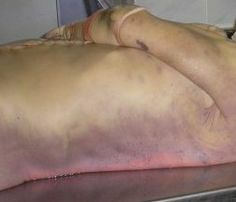 Livor Mortis (Lividity) is the settling of blood in body due to gravity. Livor Mortis starts to develop 2-4 hours after death, becomes non-fixed or blanchable up to 8-12 hours after death and fixed or non-blanchable after 8-12 hours from the time of death. In addition to the pooling of blood, small vessels breakdown throughout the body producing what is called petechial hemorrhages or Tardieu Spots. 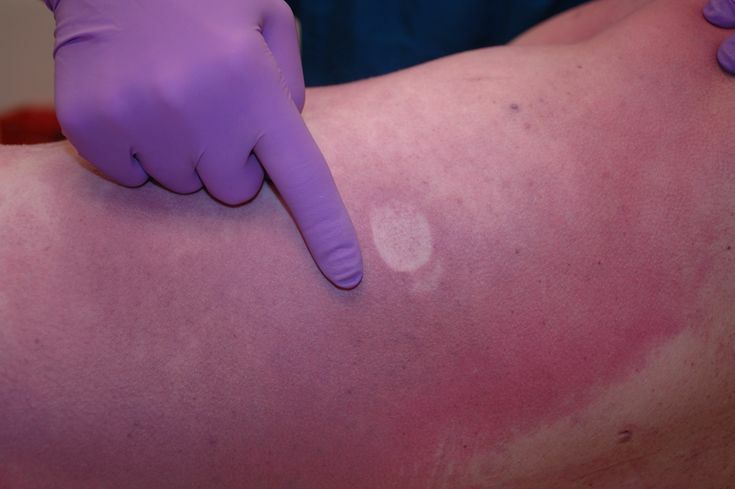 Blanching is what occurs when you press your finger on your skin and you see a white spot for a few seconds. The lightening of the skin comes from the pressure of your finger pushing the blood away from that area for a few seconds. Lack of blood in the area means lack of color until the blood rushes back once the pressure is removed. Investigators will press their finger in an area of pooled blood to see if the area is fixed or not to further determine the time of death. This process is generally done at the crime scene. The pooling of blood is a physical process based on the loss of blood pressure when the heart stops beating and will therefore occur at the same rate whether the temperature is cold or not, so it is less susceptible to atmosphere than rigor. But as you can see from the timeline below, Livor does not have very precise measurement of the time of death after 12 hours so it is also less helpful on bodies found days or weeks after death. This means that the body drops approximately 1.5 degrees for each hour after death. Investigators at the scene can look at the eyes to make an approximate time of death based on the cloudiness seen. The stages of decomposition are well known and can be used as a rough guide for the time of death especially in those bodies not found for weeks or even months. While Rigor, Livor and Aldor Mortis are all listed as stages of decomposition, they all occur within 1-48 hours after death. Later stages of decomposition must be used as estimates after the 48 hour window. There are two main ways the body decomposes: Autolysis and Putrefaction. Both of these processes take place by chemical reaction so both are subject to the typical kinetic controls of a chemical reaction. Autolysis is the process by which digestive enzymes within the body cells break down carbohydrates and proteins. Putrefaction occurs rapidly when there is excess heat, an illness present such as peritonitis where excess bacteria were already present or in an environment where external bacteria are high like a sewer. Cooling of the body can slow putrefaction and freezing can stop it entirely. Putrefaction (4-10 days after death) � Autolysis occurs and gases (odor) and discoloration starts. Black putrefaction (10-20 days after death) � exposed skin turns black, bloating collapses and fluids are released from the body. Butyric fermentation (20-50 days after death) � the remaining flesh is removed, butyric acid is formed "fermenting" the remains and the body begins to mold if in contact with the ground. Dry Decay (50-365 days after death) � decay is very slow now due to lack of fluids, hair and fingernails fall out. The degree of putrefaction allows investigators to roughly estimate the time of death based on this timeline but again you should note the broad the ranges of time. This is not an exact science which will make prosecutors very unhappy. Plants and insects are often used to approximate time of death. Through observation at a crime scene it is often possible to know how long a body has been there. For example, grass that is covered by the body will slowly wilt and die. The rates by which specific species of grass die when covered is actually known and taking a sample of the grass to a botanist can give you a time of death if the person was killed at that scene or a time when the body was dumped if they were killed elsewhere. Insects, flies specifically, rapidly infest an unprotected body and maggot formation (while gross) has well understood timeline that can be used to determine time of death. Taking samples of the maggots present to an entomologist (bug doctor) will give you time of death fairly accurately assuming the flies have access to the body immediately after death. One method for approximating time of death not listed in the table is the determination of Vitreous (eye fluid) Potassium concentration. The rate at which potassium leaks is not the same for all areas of the world and coroners have tables that help them establish the correct leak rate for their area. The Vitreous Humor is a gel like fluid that composes most of the volume of the eye. You have now been introduced to the many methods investigators use to determine time of death in a victim. Now let's take a closer look at the chemistry behind some of the methods and processes just discussed. No part of this publication may be reproduced without the written permission of the copyright holders.